I’m not a super picky eater, so one of my favorite things to do when traveling is try new foods. I’ve found that plenty of the foods I fall in love with in another country happen to be available back home, but I’d just never branched out to try something I couldn’t pronounce. For example, my very favorite Thai dish is something most people around here have never heard of… and it’s way, way better than Pad Thai, guys. 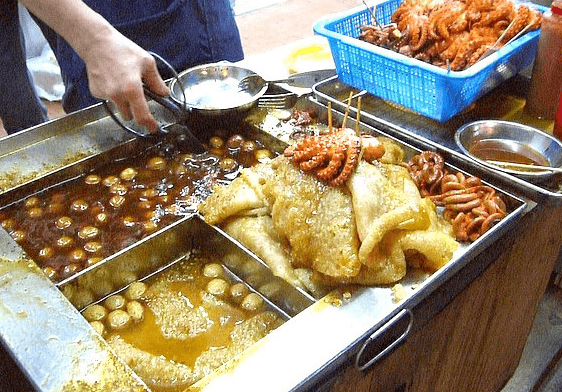 So, here’s a rundown of my favorite foods from other countries – and some suggestions for what to try on your next trip, whether it’s to one of these countries or to your local Mom & Pop ethnic restaurant. Som Tam Salad: Listed as #46 on CNN’s World’s Most Delicious Foods in 2011, this might be my favorite food in the whole wide world. 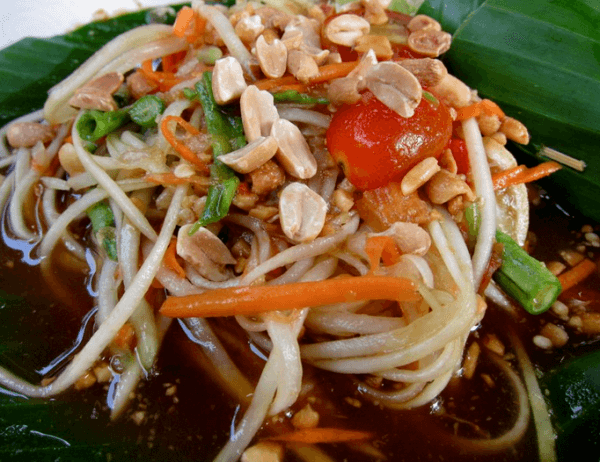 In English, it’s called Green Papaya salad because it’s made with unripened (still green) papayas, julienned. Then, slices of tomato are added and shrimp, followed up with a very spicy sauce that has a slight peanut taste. Jeffrey will sometimes have sweat pouring down his face because it’s so spicy, but we just can’t stop eating it. One time, we stopped in a little Thai restaurant on the side of the road in SC and asked for the salad even though it wasn’t on the menu– the result? Some of the best som tam I’ve had since our trip to Thailand…and a new friend for life. Note: Only try this if you’re okay with spicy food! 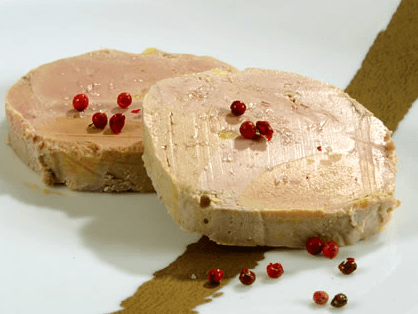 Foie Gras: OK, to be honest, goose liver has always disturbed me. I’m all about trying new things but…goose liver? Gross, right? Well, I’ve recently changed my tune. When we were in Bordeaux, France a few months ago, we ate dinner at Jeffrey’s host family’s restaurant (Jeff studied abroad there in 2009). He insisted that we get the foie gras, which he claimed was the best he’d ever had. So, in order to be a team player, I tried it. And, I promise, you forget you’re eating goose liver pretty quickly. 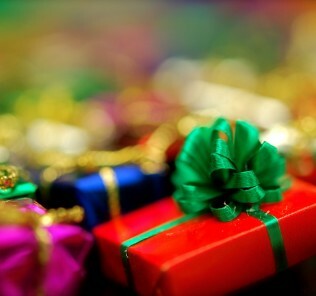 It is so delicious!!! Try it!!!! 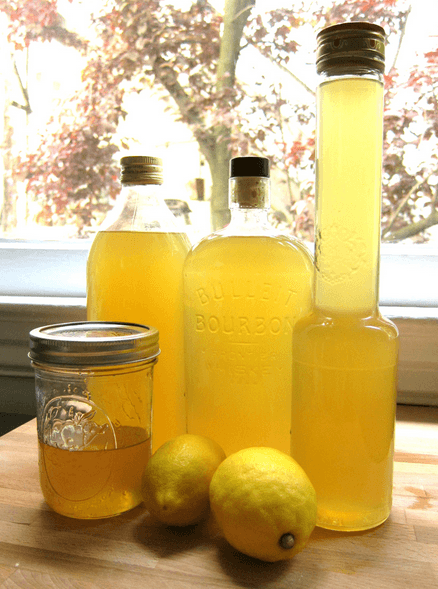 Lemoncello: I could go on and on about Italian food – it’s my favorite genre (I could eat pasta 3x a day for the rest of my life). So, yes, I could tell you about risotto or pesto or even tiramisu, but you probably already know all about how tasty those are. BUT, have you tried lemoncello?? It’s the after-dinner liqueur of choice for Italians and most of them make their own from scratch – from lots and lots of lemon zest. 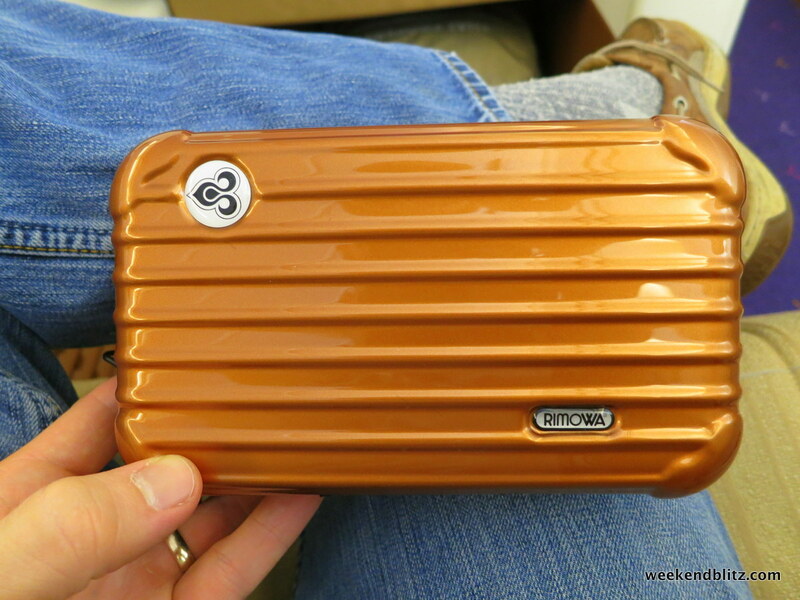 It’s a trademark of the south of Italy, but it’s increasingly popular in all of Italy. Jeffrey and I recently visited my host family in Siena, Italy, and my host dad gave us very, very detailed instructions on how to make our own lemoncello, so stay tuned soon for the recipe! 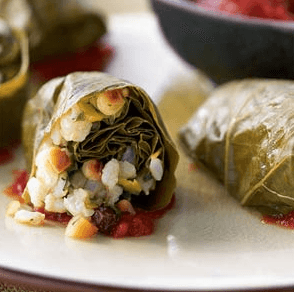 Stuffed Grape Leaves: Turkey is known for its Mediterranean culture and food. It’s where East meets West, Asia meets Europe – so of course, they’ve taken the best of both worlds and their cuisine is freakin’ phenomenal. And, bonus, it’s healthy, too! One of my very favorite things I tried there was the stuffed grape leaves (called Dolma or Sarma). Usually stuffed with rice, minced meat (sometimes lamb), onions and herbs such as dill, mint or parsley, these little apps are then drenched in olive oil and deliciousness. The grape leaves give them a very distinct flavor, and, then you get to put a little lemon-yogurt sauce on top. Hello!! These are so good! And, you can usually find them at any local Mediterranean deli. Now you have no excuse not to try them. Everything: How do these people stay so chunky healthy? The food is bland and weird…not to mention very heavy. Fish and chips, their ‘typical’ meal is okay once, but, guys, there’s nothing special here. I know you’re good at defeating the French in most things, but what happened with the food? 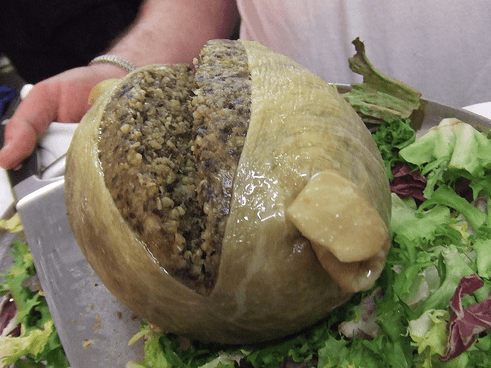 Top of my list of things not to try: haggis (a savoury -the extra ‘u’ is the British spelling- pudding containing sheep’s liver, heart and lungs, mixed with onion, oatmeal, spices – THEN traditionally encased in the animal’s stomach and simmered for three hours). I had to try haggis as a kid and I think that qualifies as a form of child torture. 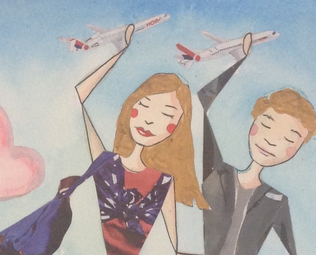 Jeffrey and I traveled to Hong Kong briefly and kept looking for the delicious food they must have been hiding. No matter where we stopped, the food was mediocre at best. Finally, we upped our anty and headed to what looked like one of the finest restaurants in town, thinking that if the good food is anywhere, it must be here. Instead, we just paid top Hong Kong Dollar for something you can find at your corner Chinese fast food restaurant, like Sweet and Sour Pork.